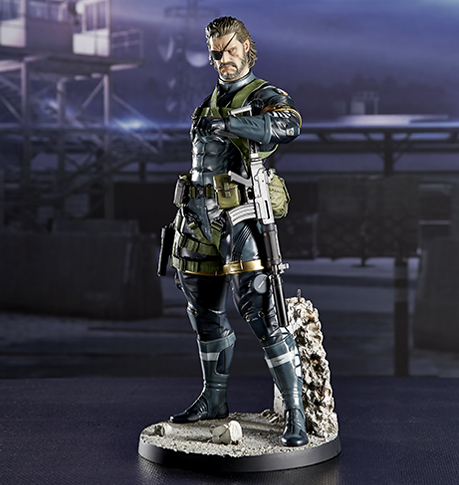 The standing pose captures both the characters’ tension and confidence as he scans his environment, holding a gun in his right hand, and a knife in his left, which is special equipment from CQC. Using the concept of "Aspiring a masterpiece sculpture of SNAKE," the pose was the most time consuming process for everyone involved. The whole sculpt, from the subtle sign to the fine details of the equipment, was thoroughly supervised by Yoji Shinkawa (the art director of Kojima Productions), and made it possible to recreate his original art perfectly. There are 3 interchangeable heads included: normal head, scarred head from the main visual of the video game, and night-vision goggles version. The assault rifle is interchangeable and can be displayed with or without the suppressor. ●Ultra Tokyo Connection (North America)　click here!! ●D4TOYS (Other countries)　click here! !